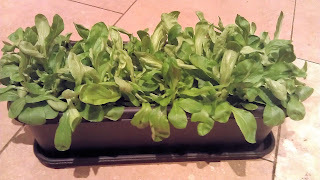 While I like growing lettuces - I love the way they go from being a small floppy collection of leaves to big-hearted and ready for picking in the space of a week and the fresh crunchiness of a homegrown lettuce cannot be replicated in anything you buy in a shop – I’m increasingly drawn to new tastes in leaves. Pea shoots are irresistible, although I’ve learned the hard way not to pinch out the growing shoots of the plants I’m growing for their pea pods. These days I’ll grow pea shoots as microleaves, using up the remains of a packet and scattering them over vermiculite in a shallow tray (a supermarket veg tray is ideal and usually comes complete with drainage holes in the bottom). Put the tray on a shallow bowl – or deep plate and pour water onto the plate - not the tray. Water will be drawn up through the drainage holes into the vermiculite without drowning it or displacing it. The peas should germinate in 2-3 days and shoots will be ready for eating within a week. This same microleaf technique works with lots of different leaves and it’s well worth experimenting. Basil, rocket, radish, coriander will add flavour to salads and garnishes – and use up any dusty remains of a seed packet when there isn’t really enough to sow outside. Oriental leaves like mizuna and mustard are good for giving salads a peppery punch. Mizuna is probably the easiest leaf in the world to grow, although I personally think a little goes a long way. It’s not the most exciting taste in the world. For a leaf with a nutty bite to it, rocket is hard to beat. It grows readily in a pot or in the open ground and will readily self-sow as well so you can have rocket growing throughout the season for very little effort. Like mizuna and mustard it’s quick to bolt if there’s any check in its growth such as a dry spell, but the flowers are good to eat as well and the creamy yellow petals are delicately decorative. 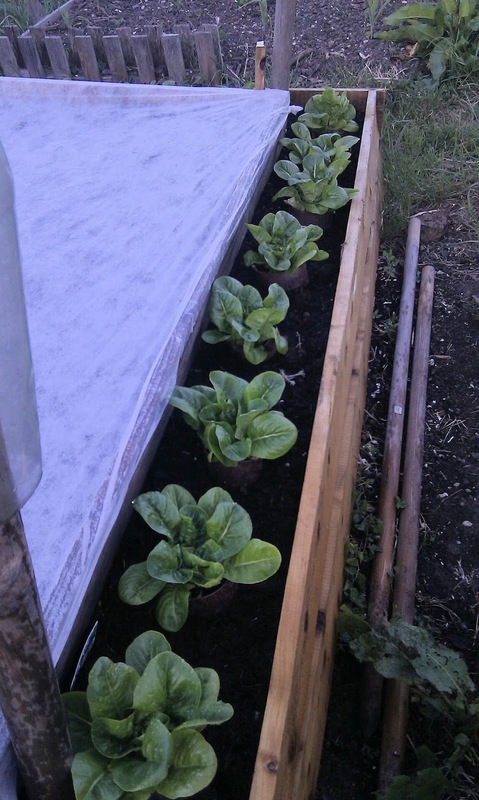 For a long-lasting salad plant, corn salad or lamb’s lettuce is my favourite. I grow this in a long trough on a windowsill, starting it off early in the season (Jan-Feb) indoors and moving outdoors when the weather warms up. Great for cut and come again leaves. A heavy layer of vermiculite over the compost in the trough will keep the soil from splashing the leaves when you water, but be gentle with the watering can anyway – don’t blast it. 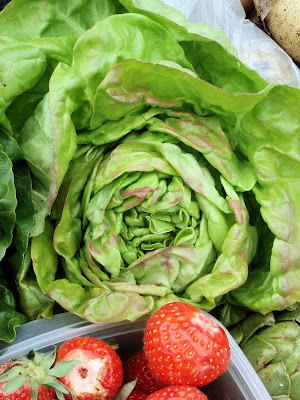 One of my favourite salad leaves is the French frisee: crunchy-stemmed and blanched in the middle. 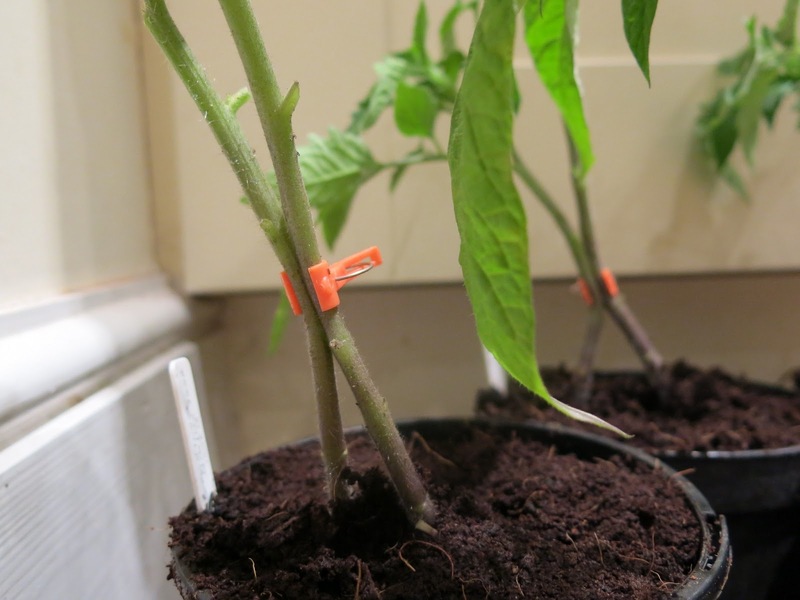 Some varieties are self-blanching but for those that are not, growing the plants to maturity without blanching will give you tough, bitter leaves. The blanching process tenderises both the texture and flavour of the leaves. I’ve had very variable results with trying to blanch my own, and must give this a go again next year. To blanch the frisee, choose a plant with plenty of healthy green leaves, and either tie up the central leaves with garden twine, or place an upturned bucket over the centre of the plant - the idea is to exclude light (as you do when forcing rhubarb). Make sure the plant is completely dry before you cover it. On several occasions I’ve uncovered my frisee to find a soggy mess. Lettuces just beginning to develop plump, firm hearts. Troughs of mixed leaves just outside the back door mean you can throw together a salad at short notice. Three of my newly-grafted tomato plants, in which the top of a good fruiting variety (Black Russian, in this instance) has been grafted on to a vigorous, disease-resistant stem and root. These plants have now been moved somewhere dimly lit to recover from their transplant surgery. After three or four days, I'll move them back into the light and if the grafts have taken well, remove the orange grafting clips. When I see new leaf growth at the top, I'll cut off the old root stem and cut down the bare top of the rootstock. 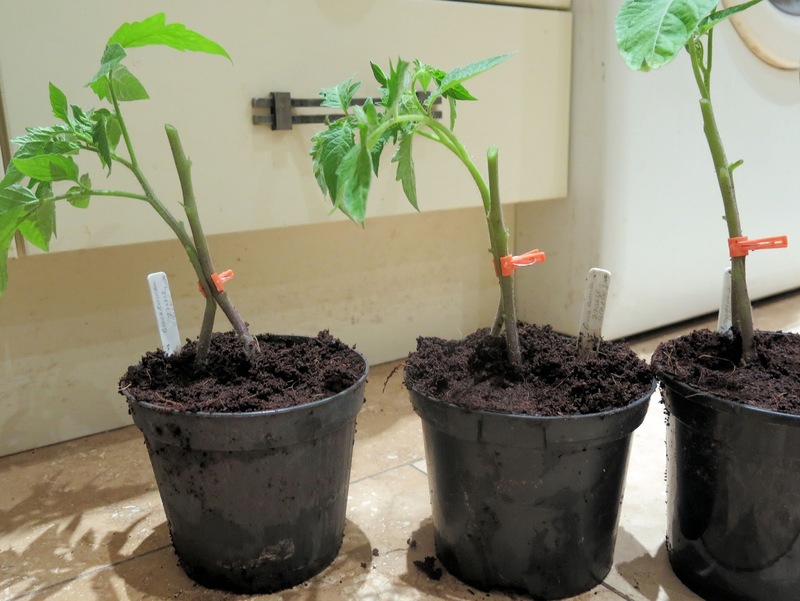 Once the plants are trimmed, the 'new' plant will consist of the leafy top that you see growing to the left, and the vigorous rootstock, which is the right hand stem. The graft in close-up. There's a full description of how to perform a tomato graft at http://secret-garden-club.blogspot.co.uk/2012/04/how-to-graft-your-own-tomatoes-for.html. It's not technically difficult, just a bit fiddly. These plants are rather larger than you would normally graft - ideal for the ham-fisted like me.